I was worried yesterday morning. I was worried about what I could possibly write about over the course of a month leading up to a Rose Bowl that most Badger fans weren’t all that amped up about. The departure of Bret Bielema for the “greener pastures” of Fayetteville surprised everyone. By all accounts Bielema had been happy in Madison and no one suspected that he was looking at other opportunities. Barry Alvarez was “very surprised” when he learned of the change according to his statement on the matter. Bielema’s departure for the Razorbacks ended one of the more successful coaching transitions in the history of college football. In his last 7 seasons as head coach, Barry Alvarez was 58-31. This stretch included his third Rose Bowl victory and six bowl games. Bret Bielema’s 7 years in Madison ended with a 68-24 mark – a better winning percentage than his predecessor - with bowl berths every season including three trips to Pasadena. Teams making the transition from an established coach to a successor fail as often as they succeed. It is no easy task. After Steve Spurrier departed the Florida Gators for the promise of NFL glory, Ron Zook muddled through three mediocre seasons before getting fired. Rich Rodriguez lead Michigan for three tumultuous seasons after Lloyd Carr’s retirement leaving behind a mess which the program is only now fully emerging. The Alvarez-to-Bielema transition was so successful the program is as well regarded as it’s been in the entire history of Badger football. Despite all this Bret Bielema was never fully embraced by the Wisconsin fan base. Bielema earned a reputation as a “big talker” whose execution on the field fell short of his sometimes brash pronouncements. His teams had a habit of seemingly wilting under pressure in big games, edging close to signature victories but never quite sealing the deal. His playcalling and use of timeouts (perhaps best exemplified in the hail mary loss to Michigan State last season) at decisive points in games was puzzling and made it look as though the stage was simply too big for him at times. To some, Bielema was simply a bully who ran the score up on lesser opponents (see “The Card” incident against Minnesota in 2010, Austin Peay 2009 and Indiana since let’s say 2005 or so) while shrinking against marquee teams. In a lot of ways Bielema was in a no-win situation. In the same way Bob Devaney – Barry Alvarez’s coach and mentor at Nebraska – tapped Tom Osborse to be his successor in Lincoln, Alvarez picked Bret Bielema from his staff as the next head coach at Wisconsin. There was no formal coaching search. Alvarez gave it a Captain Picard-like “make it so” (yes, a Star Trek Next Generation reference…for the ladies) and it was so. 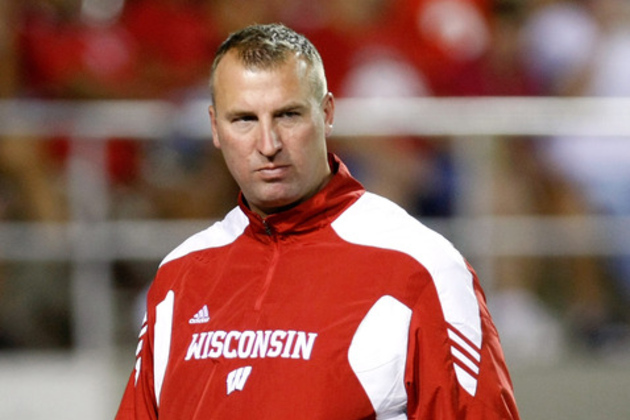 Bielema’s midwestern background and successful if short history with the Badgers gave him the look of a “lifer”. In a lot of ways Bielema was in a no-win situation. His problem was that Alvarez never left. Alvarez took an active, public role as Athletic Director (as he should have, no fault or criticism implied) keeping him and his successes fresh in the minds of fans and pundits alike. From the outside, Alvarez’s relationship to the football team is like no other program in the country. Don’t believe me? Think about the narrative spun by announcers of every televised Badger game. Inevitably there was a point where Bret Bielema was described as “continuing the traditions of power football” established by Alvarez. Working for a Hall of Fame coach made defining a separate legacy difficult for Bret Bielema in Madison. It’s unusual for a home Badger game to pass without multiple shots of the AD in the box or along the sidelines astutely watching the game looking like he just needs a headset to be part of the action once again. Fox did it in the 70 point stomping of Nebraska last week. Few programs are so closely identified with a coach seven years removed from the field as the Badgers are to Alvarez. He is the ever-present force watching over his football program the way a protective parent watches over their adult children. For Bielema, successes were often credited to continuing the ways of his predecessor and boss, his failures evidence he was a hollow replacement at best. If nothing else a tour of duty with the Razorbacks allows the former Badger coach to define his career without the legacy of Barry Alvarez hanging over him. Some have cited a bigger payday as motivation for his departure. While he is getting a pay raise (the actual amount still seems to be in dispute) for the job security he’s giving up it doesn’t seem all that significant. The shark infested waters of the SEC West are not a forgiving or friendly place. Starting over at a new program Bielema can escape the shadows of his Hall of Fame former boss and define his career without that permanent association to the guy who “built it all”. Bielema is still a young coach with a lot of years ahead of him. A successful run with Arkansas (defined by the coach as winning “Championships”) against the best minds in college football on a weekly basis would certainly cement a legacy of his own. In his office overlooking the field at Camp Randall, Barry Alvarez has been working feverishly plotting the future of the Wisconsin football program as his legacy he worked so hard to build is now threatened. His goal has long been to solidify the fortunes of Badger football and it’s place as a winning program. The sudden departure of Bielema has thrust him back into the football forefront. It has shown him to be the most important, unifying figure in its future. If that weren’t the case he wouldn’t be the head coach for the Rose Bowl next month. He wouldn’t be involved in football recruiting this weekend. Players wouldn’t text him this week asking for advice. They wouldn’t ask him to coach the Rose Bowl; that idea did not originate with him but with team captains who’ve never played a down of college football with him as coach. There is no other figure associated with the program that can equal his stature in Madison. 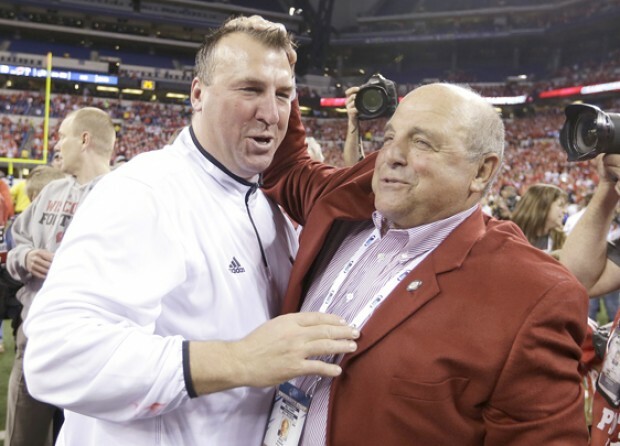 Barry Alvarez will be back on familiar ground come New Year's Day. The decision he makes on the next head football coach for Wisconsin is critical. At 65, his days as athletic director may be short. This coaching selection could be his last. He is working without a search committee and will make this selection on his own. A misstep here and much of what he’s built and maintained since coming to Madison 20+ years ago may well be undone..
Alvarez admitted in his press conference today the only time he really misses coaching is when the game is played on the big stage. He loves the chance to rise to the occasion. His 8-3 record in bowl games testifies to that. His three Rose Bowl victories in as many opportunities are his crowning achievement. His last challenge may be his greatest: find a coach to step out of his shadow and carry the program forward on their own terms with the moxy and gravitas to be their own man next to their Hall of Fame Athletic Director. That person has to be special. That person is hard to find. It’s a challenge that’s about as big as they come. If anyone has the track record to face down a challenge like that it’s probably the guy leading the team out of the tunnel in Pasadena come New Year’s Day. Posted in Past Seasons and tagged with Barry Alvarez, Bret Bielema. December 6, 2012 by Buckaround.